The expectations of planetary scientists are based on the theory that planets and moons formed from a primordial solar nebula. "As we dig deeper into the solar system, sifting for clues, one thing we keep learning is that in planetary exploration, expectation and discovery often have little correlation." David H Grinspoon in "Venus Revealed." When scientists discovered rings of dust and gas around other stars, they used the nebular theory to interpret the rings as "accretion disks." Then they claimed the discovery confirmed the theory. But there is no evidence that the rings around other stars are "accretion disks." In fact the evidence suggests that they are "expulsion disks:" Stars are regularly seen ejecting matter. However, fervent belief fosters the habit of ignoring uncomfortable data and doubtful assumptions. It seems, as Bertrand Russell wrote, “What men want is not knowledge but certainty.” Because scientific knowledge is necessarily provisional, certainty can only be had through belief. While that remains so, discovery will continue to confound expectations. Some of the loudest alarms that all is not well with the nebular theory were sounded at Venus, with its hellish temperature and crushing atmosphere. If the nebular model were correct, we should expect a regular gradation of element and isotope abundances in the planets and their atmospheres as we move out from the Sun. The early Sun is supposed to have gone through a phase of producing powerful stellar winds that should have swept away the lightest elements such as hydrogen and helium. But it cannot explain why the deuterium/hydrogen ratio is 120 times higher on Venus than on Earth. And the noble gases argon and neon are 50 to 100 times Earth's atmospheric abundances. Krypton is enriched 3 times and xenon is slightly enriched. The argon/krypton ratio for Venus is 700:1, compared to 30:1 for the Earth. These gases are thought to be primordial. On Venus the argon 40/argon 36 ratio is 1:1. On Earth the ratio is 400:1. Argon 40 is thought to have accumulated from the decay of crustal potassium 40 since the planet was formed. 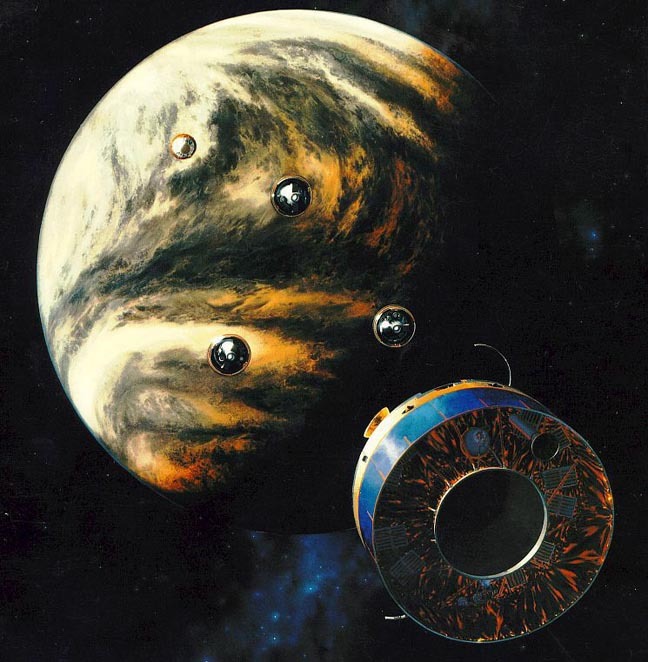 Venera 12 carried the only experiment that actually collected cloud particles and analysed them. It found that the most common element in the clouds was chlorine! The clouds held 20 times more chlorine than sulphur. Most of the mass of the clouds was an unknown substance. "These results are so difficult to reconcile with other measurements that American researchers have tended to ignore or discount them, although no one has explained why it should be in error,” wrote David Grinspoon in "Venus Revealed." All of these discoveries were unexpected. Ad hoc stories have been suggested to explain some of them. Others, like the disappearing water, are simply ignored. The Electric Universe model expects diversity in planetary atmospheres because they are formed in a process of electric discharge ejection from a larger body – a gas giant or dwarf star. Plasma discharges are an efficient means of segregating elements and their isotopes based on their critical ionisation velocities and atomic mass. This is the reason for the separation of elemental colors in beautiful planetary nebulae. A cosmic plasma discharge is also a copious source of neutrons. Atoms that are bombarded by these neutrons form short-lived radioactive elements. That explains the puzzling presence of the decay products of such elements in meteorites, which are debris from the planetary birth process. 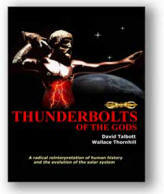 The cosmic discharge is also powerful enough to cause nuclear transformations. The Electric Universe model provides a simple way of understanding the differences in atmospheric composition between Earth and Venus. But it applies to Titan as well, where more atmosphere puzzles were recently uncovered. Both Venus and Titan are young planets, related by birth. Their atmospheres are not yet in equilibrium – as shown by the destruction of water near the Venusian surface and by the remnant of methane in Titan’s atmosphere. The abundance of water on Earth and water ice on many moons in the outer solar system signals those bodies' earlier birth under electrical conditions that were different from those of Venus and Titan. At first sight, the atmospheric compositions of Titan and Venus appear too dissimilar for them to be related: Titan's atmosphere is predominantly nitrogen, but Venus's atmosphere is mostly carbon dioxide. In the electrical model the difference is superficial: Ancient records describe Venus going through a prolonged and spectacular discharge phase following her birth. And the nuclear energy difference between the nitrogen molecule and the carbon monoxide molecule is quite small. In the presence of the hot, iron-bearing surface of Venus, acting as a catalyst, that planet’s nitrogen was converted to carbon monoxide. The carbon monoxide reacted with water vapor at the hot surface, in a well-known industrial process, to form carbon dioxide and hydrogen. The hydrogen is found to be escaping in a steady stream from the upper atmosphere. These steps are a very effective means to remove hydrogen from water and to leave behind deuterium to give the observed phenomenally high deuterium/hydrogen ratio.